Apple is famous for thinking differently and creating consumer electronics that are both easy to use as well as being powerful devices. The Cupertino based tech giant boasts 98,000 employees worldwide and claims to have created over 1 million jobs. Apple employees respect their CEO too: 81% of employees approve of CEO Tim Cook, an impressive feat considering he has to fill in for the famous Steve Jobs. So how do you climb aboard Apple’s spaceship? What does compensation look like, and how is the working environment? Apple obviously emphasizes tech hiring, which shows in its currently available internships – all 14 are in the tech field, be it software or product design. Interns on average make around $35 an hour. Unfortunately for business majors, there aren’t any internships currently available, but That should not discourage those looking to work for Apple in the future though,as there are plenty of opportunities for those with work experience to join Apple in a variety of fields. Apple, along with its technological innovations, is known for its secrecy (pioneered by Steve Jobs himself). Hard numbers on applicants are impossible to come by, and most sign nondisclosure agreements before interviewing, even for retail positions. To get an idea of what the interview process looks like, take a look at this blog post by Luis Abreu. Abreu was contacted by someone within Apple for a position after posting his extensive knowledge of iOS. After accepting the invitation, he was then screen and then interviewed by 4 different people via Facetime for 2 hours total. Luis made it through that round and was then flown out to Apple headquarters to interview for another 6 hours before ultimately getting rejected. Clearly Apple doesn’t take interviews lightly, and are willing to invest huge resources (they flew Abreu out from the UK) to ensure they have the right candidate. Apple has 66,000 employees in the United States alone, but where do they look for new talent? Here are the top feeder schools for Apple. 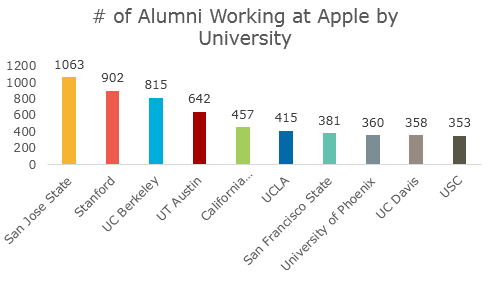 San Jose State University and Stanford hold 34% of alumni. How do people feel they are compensated at Apple? Only 57% of employees believe they are paid fairly, though keep in mind this includes both retail and corporate. This is on par with companies of a similar size, and 3 percentile points higher than the national average (54%). However, Apple ranks quite highly for benefits satisfaction, with 88% of employees satisfied with their benefits (such as bonuses, stock options, and healthcare), compared to companies of a similar size ranking at 74% and the nationwide average of 67%. 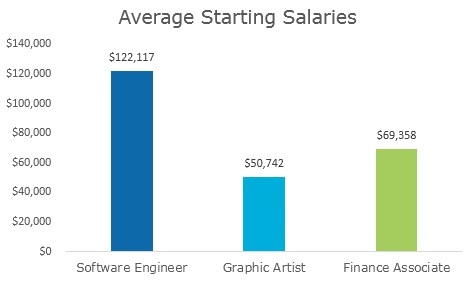 Not surprisingly for a tech company, salary priority goes to the software engineer, with the salaries for other careers a bit behind. The work environment at Apple is unsurprisingly fast paced, with 46% of employees claiming the work pace to be extremely fast, and 43% of employees working 10 or more hours a day. Around 75% of employees say Apple’s work environment is positive – this may sound high, but compare that to the national average (78%) and suddenly the picture isn’t as pretty. This lower than average environment likely has to do with the higher than average workplace, so if high-speed work isn’t your cup of tea Apple may not be the right fit for you. Overall, Apple as an employer is great for some but not for everybody. The pay is generous for tech, but there’s a noticeable gap among other departments. The tech giant is incredibly secretive, and not all employees enjoy going behind the curtain. Questions? Comments? Ideas? Reach out.